Let’s Get Crafting Magazine is for the crafting enthusiast. Knit or crochet patterns included in each issue. Buy a single copy or subscription to Let's Get Crafting magazine. Get advice on techniques. Find inspiring ideas for your next big project. From toys to clothes, get it all in the next issue. Everyone loves homemade crafts. Each craft will make your home cozy and friendly. Discover exclusive knit and crochet projects to give as gifts or decorate your home. Each pattern is easy to follow with step-by-step instructions. Patterns have been tested and include tips on making the craft worthy of calling homemade. Learn new stitching techniques that can be used in other projects. Crochet or knit toys for the little ones. All children will love your unique toys to play with and share with siblings. These toys are soft and unique. Make them for gifts for friends, family, and given at baby showers. These toys are also washable! 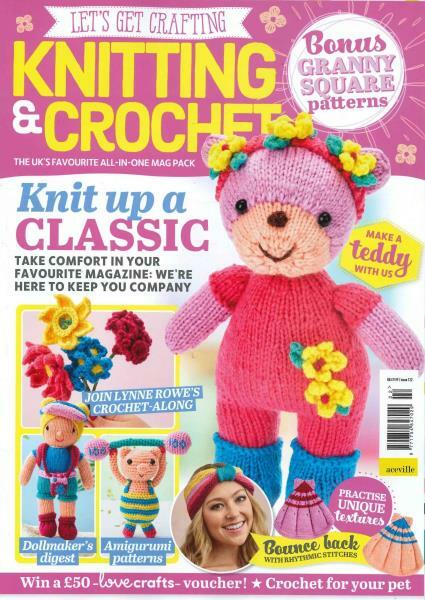 So many free knitting and crochet patterns in each issue, it’s difficult to decide on just one. Get holiday advice to liven up your home. Read about the newest crafts that everyone must-have. In each issue, a new unique craft is featured. Find out what is in demand in craft shops and learn how to make your project look professional while keeping the homemade look. Discover secrets to making crafts that will make them a treasure for years.